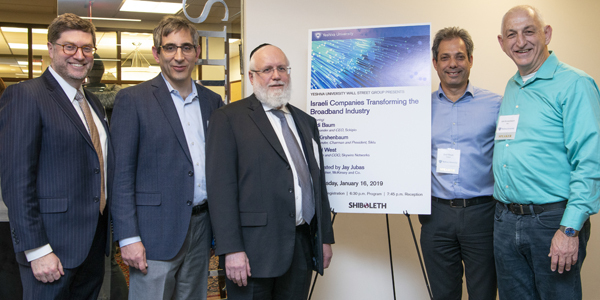 On Wednesday, January 16, 2019, the Yeshiva University Wall Street Group, a professional networking organization created by the YU Office of Alumni Affairs, presented “Israeli Companies Transforming the Broadband Industry,” hosted by Shiboleth LLP. Jay Jubas, senior partner at McKinsey & Co., moderated a panel discussion among Dudi Baum, co-founder and CEO of Sckipio, and Izik Kirshenbaum, co-founder, chairman and president of Siklu (both of which are Israeli-based), and Alfred West, chairman and COO of Skywire Networks (based in Brooklyn). 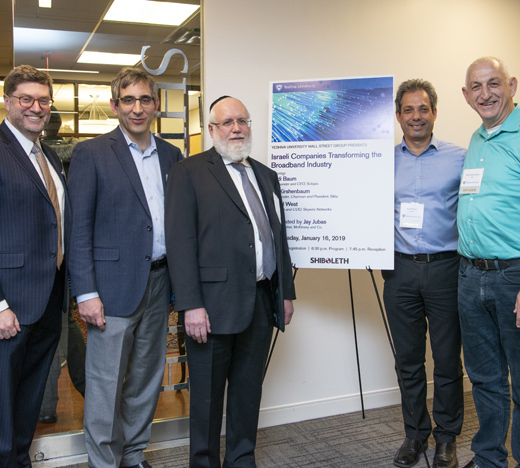 In their wide-ranging discussion about broadband, internet access and the state of the telecom industry, they saw two significant challenges for the future, one narrowly technological, the other dealing with the telecommunications market more broadly. The technological challenges involve what is known as the “last mile”: running connections from a central juncture into buildings that most likely are not outfitted to handle the connections, such as older structures with only copper wiring installed. Each company has unique solutions to this problem. On the broader economic front, all the panelists bemoaned the digital divide in the United States and did not see the current telecom companies, like Verizon, being able to narrow that divide, given their current investment strategies and plans for building out infrastructure. They also noted that the United States government does not invest in infrastructure upgrades at anywhere near the level of countries like China, leaving it with an aging system that cannot adapt to meet the needs of its population and economy. This does give smaller companies like theirs an opportunity to serve untapped markets, but while they may prosper, the lack of a national digital investment strategy leaves the larger questions unanswered. Click here for more information about the professional networking opportunities sponsored by the Office of Alumni Affairs.